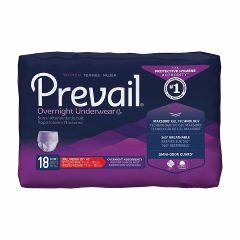 The Prevail for Women: Overnight Absorbency Underwear provides superior protection with higher absorbency and faster absorption for heavier incontinence episodes or extended wear. Take on every day with confidence in pretty lavender Prevail for Women: Overnight Absorbency Underwear. Specifically designed for women who need moderate to heavy or extended use leakage protection, it has the look and feel of regular underwear. Prevail Protective Underwear keeps you 5X drier than the leading brands*. Prevail for Women: Overnight Absorbency Underwear provides superior protection with higher absorbency and faster absorption for heavier incontinence episodes or extended wear. Small/Medium: Waist 28" - 40", Hips 34" - 46"
Large: Waist 38" - 50", Hips 44" - 58"
X-Large: Waist 48" - 64", Hips 48" - 64"